Places: Five states (NM, AZ, UT, NV, CA), four National Parks (Grand Canyon, Zion, Death Valley and Yosemite), two National Forests (Kaibab in AZ and Inyo in CA), one National Monument (Devil’s Postpile, CA) and one major city (Las Vegas, NV). Gas: $189. When I drove straight from Cerrillos to Palo Alto via the interstate, a distance of 1,100 miles, the trip cost me $150 in gas. So this 4 day epic cost me only $40 more, approximately one tank of gas. The difference lies in how much gas you burn driving 80 mph on the interstate versus keeping it under 55 on the back roads. See? Slow down! See more! Save money! America the Beautiful National Parks Pass: $80. The pass paid for itself on this trip since it saved me the entrance fees to the Grand Canyon: $25, Zion: $25, Death Valley: $20, Forest of the Ancients: $3, Devil’s Postpile National Monument: $10 and Yosemite: $20 and it’s good until September 2012. Click here for more tips on cheap road tripping! 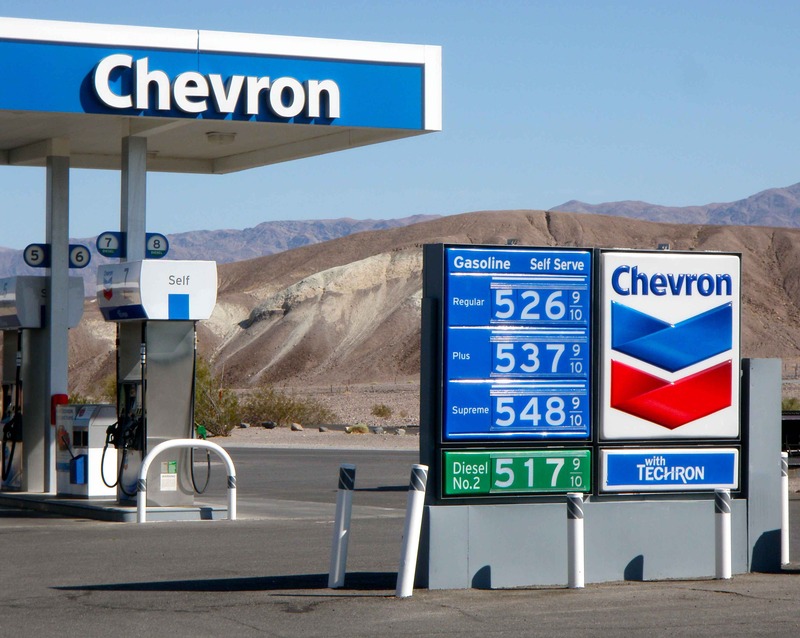 Cheap travel tip: Don't buy gas in National Parks! Yikes Death Valley! This entry was posted in Photography, Road tripping!, Vagabonding 101. Bookmark the permalink. I think I have a picture of that same gas station, when the gas was up around $4.00 or so back in 2004, and I thought that was a lot of $. We drove over the Tioga Pass also. What a drive! I love all the granite and the lake. I believe it was snowing some when we went over it, in September. Impressive! I’m trying to find as many ways to cut corners to travel. It’s one of my biggest passions. I’ve just recently come across your blog (as in, two days ago) and have fallen in love. I’m a single mother to a six-year-old daughter, who loves to travel, and four-year-old fur son, who has yet to travel long distance. Perhaps I haven’t perused enough, but my two questions are :what is your occupation and what do you feed your fur babies?